Baked Veggie Bean Burgers made of loads of vegetables and protein rich kidney beans. Since its baked and not deep fried, this vegetarian or vegan burger turns out to be a low calorie, low carbs heart healthy burger. Soak dry kidney beans in water overnight. Cook them until soft. Drain the water and place the cooked beans in a strainer for about 20 minutes. You can use any other beans of your choice like chickpeas/chana or black beans and canned beans will save some time as well. Blend/Grind green beans, green peas, lima beans and carrots without adding water. I used a food processor to finely chop these frozen vegetables. Similarly, chop the other ingredients in the food processor as well - garlic, bell peppers, onion, jalapeno peppers and cooked kidney beans. All the veggies will appear finely chopped or grated. Every time I make these burgers, I use different vegetables available at that time. You can also add greeen cabbage, purple/red cabbage, black olives, green olives as well. For a little crunch, you can add walnuts, cashews, almonds as well. Preheat the oven at 350 degrees F. Grease a muffin tray with cooking spray or oil. In a big mixing bowl, add all the vegetables. Now add seasonings - salt, cayenne pepper, dry parsley, garlic and herb seasoning. Mix well. Lastly add corn meal to bind all the ingredients and corn meal will absorb the moisture of the veggies as well. Add more corn meal if required. You can use bread crumbs or semolina/rava as well. Divide this burger mix in 10 cups of the greased muffin tray. Slightly press with a spoon. Bake the burgers for 10 - 12 minutes or until the edges turn crisp and colour changes. Let the baked burgers cool for about 5 minutes. Carefully flip them on a big plate or a cooling rack. When you are ready to serve, heat a pan and shallow fry the burgers with few drops of oil or cooking spray. Apply 1 - 2 tsp of Chipotley Mayo on one half of the bun. Top it with lettuce leaf, followed by the Veggie Bean Burger, onion slice and tomoto slice. 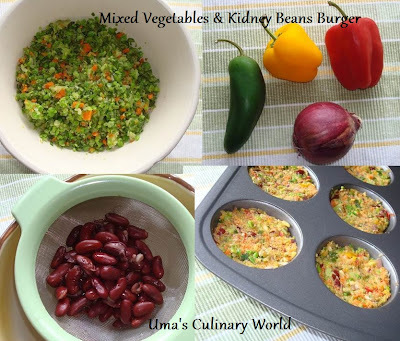 Enjoy healthy Vegetables and Beans Burger with Microwave Potato Chips or Baked Potato Fries. Delicious and healthy burger. Wonderful recipe. Am inviting myself to ur place, yummy burger. That really looks absolutely desirable!! great idea uma ,of baking the patties. Cool recipe! !